New Earth Project founder Sacha Stone delivers his message of transcending the evil of Babylon and forging a new global nation without borders and oppression in this Buzzsaw interview with Sean Stone. Speaking against the blinders of society that has been structured in the mold of Anglo-Saxon tyranny, and holding no veneration for the US Constitution or standards of traditional western society, Stone dares to blow minds in this uncensored conversation. 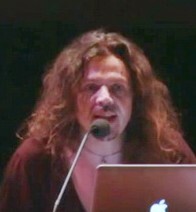 Sacha Stone is founder of the New Earth Project (http://www.new-earth-project.org/) which is the fastest growing sovereignty and consciousness movement on earth. The project hard-launches as the New Earth Nation in the first quarter of 2014 – and is already master-planning conscious communities in over thirty five nations across the globe. The New Earth Nation declares itself as the worlds first extraterritorial nation of peoples from all cultures and faiths who are choose to step out of the invisible contracts with corporate nation states and step into a new covenant of fellowship amongst all of humankind. The nation is existing under its own cognisance, as its own court of record and backed up by its own law commission, law academy and a growing army of law experts in national all around the world. Citizens and residents within the New Earth Nation are protected by this self-existing court of record. The Nation is launching its zero-point economy in 2014 which is a usury free, inflation free sovereign currency and exchange which removes banks and bankers altogether. Sacha Stone’s socio-political writings and ‘State of the World’ reports are widely disseminated and serve as harsh critiques on the disease of globalisation and covert elitism (the architecture of fear and control). At the same time he emphasises the need for a conscious return (via a total collapse of the collective human conceptual framework) back into the true ‘zero-point’ contained within the quantum of the human heart (crystal logic) – in order for us to qualify and participate fully in the next great step in our human and planetary evolution. Technological, social and economical advances are only projections of the evolutionary process of our individual and collective soul. If we are to truly manifest sustainability and foster an energy and socio-economic revolution in our times we must acknowledge that awakening to the potential of our consciousness is the chief factor. Technology and consciousness are intimately connected and it is time for humanity to engage in that conversation without fear of scorn or derision from a world still largely trapped in linear logic and limitations of the conditioned mind. 02:30 Stone speaks about Babylonian control and his organization, the New Earth Project. 08:30 Stone on how to be free of constrictions by defining a new reality and entering a virtual realm. 13:00 Entering a sovereign territory through actualization, self realization, and putting an end to invisible contracts. 19:00 The U.S. Constitution, and looking at sovereignty as a nation by nation problem.